The Friends of Ramsey County Libraries is bringing back its popular winter gala for a third year, and under a new guise – or disguise, as the case may be. 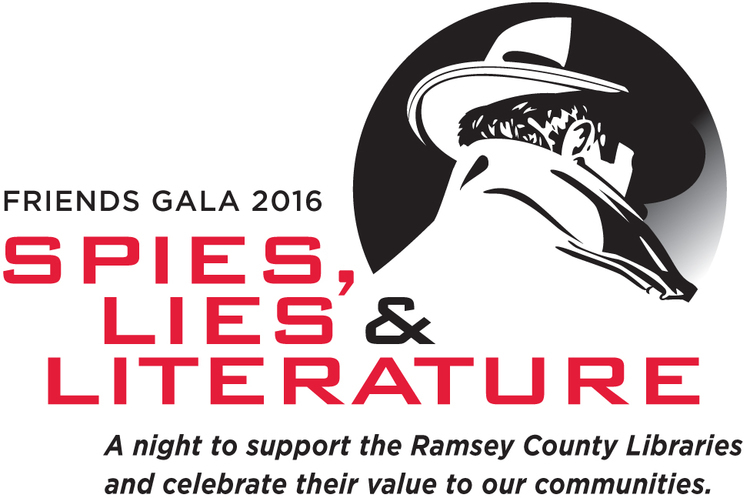 After two successful years as the Great Gatsby Gala, the 2016 fundraiser is rebranding with a new literary theme: Spies, Lies and Literature. Your mission, should you choose to accept it, is to join with the Friends at the Roseville Public Library on Saturday, February 6 (6:30-9:30 p.m.). Costumes or festive evening attire are encouraged but not required. Prizes will be awarded for the best costumes. Whether you favorite sleuth is Ian Fleming’s agent James Bond, Agatha Christie’s beloved Hercule Poirot, or the inimitable Sherlock Holmes, this night will offer something for everyone. Dancing, silent and live auctions, a spy hunt, and wine and hors d’oeuvres are among the highlights. Proceeds allow the Friends to add needed items to the lending collections of libraries in Maplewood, Mounds View, New Brighton, North St. Paul, Roseville, Shoreview and White Bear Lake. Tickets are only $50 in advance. This can be done online, or by check. At-the-door registrations are also welcome. Click here to learn more. In its earlier incarnation as the Great Gatsby Gala, this innovative gala earned the Friends of Ramsey County Libraries an Evy Nordley Award for Best Project certificate of recognition. Click here to read all about it! It's that time once again! Nominations are now being accepted for MALF’s flagship prize, the Evy Nordley Award for ‘Best Project by Friends of the Library.’ Each year, we recognize original ideas and innovative projects created by Friends with this first-of-its-kind honor. Any Friends-supported project is eligible for consideration, provided project implementation began after January 1 of the preceding year (in this case, 2015). Examples include print publications, programming events, membership drives, fundraising campaigns, and website or digital initiatives. Entry submission is free, but participation requires a current MALF membership. (Contestants unaffiliated with MALF are welcome to submit membership application and annual dues along with their Evy Nordley entry materials.) All entries for the 2016 cycle must be postmarked by June 17, 2016. If there is one thing that our stewardship of the Evy Nordley Award for Best Project by Friends of the Library has taught us, it is that Friends do not lack for creative, actionable ideas about how to help their libraries. The problem, of course, is funding those ideas. If this describes you, ALA encourages you to check out its Loleta D. Fyan Grant. Applicants are invited to make a case for grants of up to $5,000. Click here to learn more. Deadlines for this one are approaching fast, so don’t delay! As we reflect on the highpoints of 2015, it is clear that MALF owes every success to the spirited involvement of Friends like you. Your membership is a visible marker of the fact that Minnesotans care about the health of our libraries. MALF operates on a membership year equal to the corresponding calendar year. Thanks to all of you who have already renewed your membership for 2016. If you were a member in 2015 but have not already done so, you will receive a letter from us within the next few days with an easy renewal form. If you do not receive the expected letter, or were not a member in 2015, email us at info@mnlibraryfriends.org and we will send you an invoice. As in years past, Friends of the Library groups pay only $25, and Individuals pay just $10. Click here for a quick look at benefits of your membership.